iPads Eliminate Need for Laptops for 60% of Business Professionals - What Makes the iPad so Versatile? Are You Maximizing Your Usage of the iPad and Getting the Most from Your Investment? 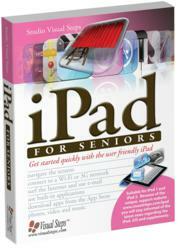 Newly-published iPad book Visual Steps iPad for Seniors Will Answer the Question. Visual Steps' iPad for Seniors shows how to use this extremely portable multimedia device. The iPad is quickly replacing the desktop as an all-purpose computer. Ten percent of all business professionals say the iPad is their primary device and 97% are using the iPad for reading. 70% of iPad owners are over the age of 35 and 50% of tablet owners are in households with more than $100,000 in annual income. These statistics were recently reported in the NPD Group's study "Tablet Adoption and Insights Report." Suitable for iPad1, 2 and the new iPad (third generation), Visual Steps iPad for Seniors is the first comprehensive guide to learning how to get the most out of the iPad's tremendous functionality and is especially created for Boomers and anyone over 50 with clear instructions in large type and step-by-step instructions. With Visual Steps iPad for Seniors the user can learn how to take complete advantage of this technology and get the most from their investment. For over 10 years, Visual Steps Publishing, a Dutch based company, has specialized in the publishing of practical and accessible computer handbooks, software user guides and other instructional materials that are tailored to boomers and senior citizens. We have sold more than one million copies of our books worldwide. Besides publishing books sold in retail, we also publish tailor-made instructional materials for seminars, training programs for corporate clients and educational institutions. The Studio Visual Steps team of authors is comprised of a variety of professionals, all thoroughly experienced in their own subject field.